"Homelessness is one of the most intractable and complex problems facing cities around the globe," says my colleague Dr. Jim O'Connell from the Boston Health Care for the Homeless Program (BHCHP). It is somewhat sobering to hear that Boston is now into its third "ten-year plan" to end homelessness. Despite the success of Boston's Housing First programs in housing many people who have lived on the streets for years, it has proven difficult to "turn off the homelessness tap". The reasons include the lack of affordable housing options and a systemic failure to break the cycle of people leaving the corrections system without somewhere to live. O'Connell has just spent a week in Perth as a Raine Medical Foundation Visiting Fellow at UWA. He recounts that around half the people entering Boston homeless shelters indicate that "a jail" was where they slept the previous night. These are cautionary warnings for Australia, where concerted efforts to end homelessness are up against an affordable housing crisis and huge public housing wait lists. Alarming numbers of people are released from Australian prisons to homelessness each year. So while ending homelessness in Australia is a vital aspiration, which needs to be backed by a coordinated national strategy, multisectoral action and greater dedicated funding, our cities also need to be better equipped to deal with the health impacts and other consequences of homelessness until it can be eradicated. One of the most costly consequences of homelessness for any city is the burden on the health system. Although mental and physical health issues can contribute to homelessness, being homeless also increases the risk of many health problems. These include psychiatric illness, substance use and chronic and infectious diseases. Across Australia, people who are homeless are among the most frequent presenters to emergency departments. Their rate of unplanned hospital admissions is high. The average stay is longer too. All of this strains the resources of our public hospitals, as shown in our recent analysis of data for homeless patients seen at Royal Perth Hospital. Globally and within Australia, pressure is mounting on hospitals to shorten stays in costly hospital beds. However, post-discharge care via less costly "hospital in the home" programs is not an option for patients with "no fixed address". As a result homeless patients face either longer inpatient admissions or are discharged when too unwell for the challenges of living on the street. And that in turn results in deteriorating health and many unplanned readmissions. An innovative solution to these problems is the medical respite model for homeless people. This originated in the United States in the mid-1980s. A respite centre enables people who are homeless to recuperate after hospital in a more home-like environment. Here they can receive follow-up care, social support and be linked to community services and accommodation providers. A more homely non-hospital environment is a critical ingredient, as hospitals can be traumatising for homeless people. Many of them have suffered violence, sexual abuse, neglect, incarceration or other forms of trauma, further compounded by the trauma of living on the streets. 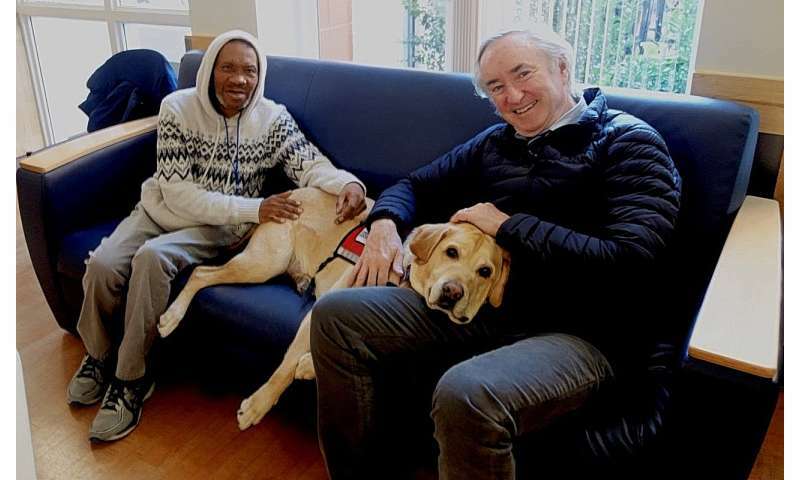 From the Boston experience, therapy dogs, social connection, recreational activities, art therapy and patient support groups are among the healing benefits that can be provided outside a hospital environment. One of our reasons for bringing Jim O'Connell to Australia this month has been to draw on his experience as a founder of the first medical respite centre for homeless people in the US. It began as a 25-bed facility in Boston in 1985 and now has 124 beds. Sadly, the demand keeps growing – for every bed that becomes available, there are 20 calls from hospitals wanting a bed for homeless patients. What facilities does Australia have? The respite centre model has flourished in North America, with over 70 in cities across the US and a growing number in Canada. Australia at present has two small examples, in Melbourne and Sydney. In Melbourne, The Cottage is literally a cottage next to St Vincent's Hospital in Melbourne. It has six patient beds, with an average stay of nine days. Our evaluation of The Cottage, published just last week, shows it provides a valuable step-down alternative and period of stability for homeless people. This enables staff to build trusting relationships and increase patient capacity to manage their own health. Tierney House is a 12-bed short-stay respite unit run by St Vincent's Hospital Sydney. Support and care is provided for around $400 a day. This is far cheaper than the average Australian hospital bed cost of $2,003 a day in 2015-16. Perth is seeking to establish Australia's first 20-bed medical recovery centre for people who are homeless. It's based on the US respite care model, but with a sharpened focus on connecting people to housing and long-term health and other support to remain housed. Linking people to a general practitioner through Homeless Healthcare will be a critical part of the model, as its GPs and nurses can provide primary care and follow-up in the community to avert future hospital admissions. As Dr. Andrew Davies, of Homeless Healthcare, and I stressed recently in the MJA, the absence of safe and secure housing lies at the core of the health disparities seen among people who are homeless. This is particularly apparent when they are discharged from hospital before they are well enough to return to the streets. Just imagine trying to recover from a hospital admission without a safe place to rest and sleep, nowhere to wash, no secure storage for medications, not to mention poor access to nutritious food and difficulty maintaining hygienic wound care. Australia is facing escalating and unsustainable health care costs, exacerbated by an ageing population and the rising burden of chronic disease. 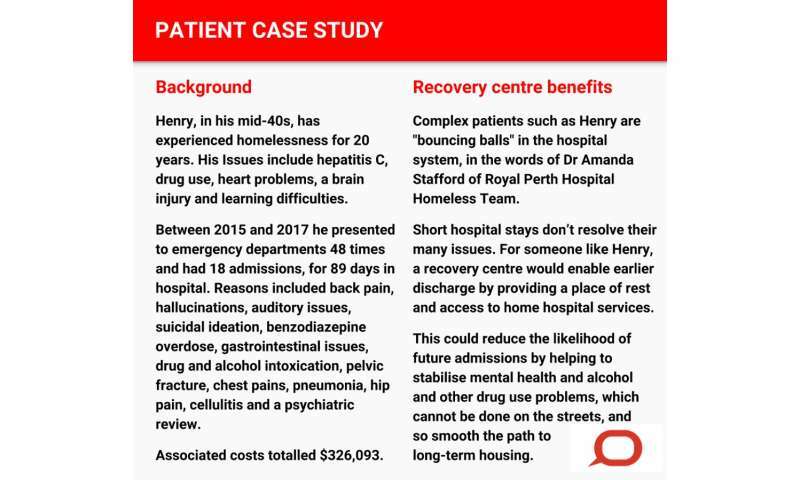 A medical recovery centre presents a cost-effective solution for government given the high rates of emergency department presentations and hospital re-admissions when people remain homeless. Published evaluations of US respite centres show 24-36% reductions in emergency department presentations. Reductions in inpatient days were between 29% and 58%. The reduced health care use equates to millions of dollars in cost savings. We need to do more than lament the revolving door between hospital and the street faced by people who are homeless across Australian cities. As Andrew Davies poignantly observes: "Acute hospitals treat acute medical problems. If we fail to address the underlying chronic disease and social determinants of the health of homeless people, we will continue to watch people slowly die on the streets." The medical recovery centre model provides a critical and cost-effective circuit-breaker. By enabling "hospital in the home" care for people without a home, it reduces hospital readmissions. Chronic rough sleepers are one of the most marginalised groups in our society. A medical recovery centre offers a safe period of respite where they can be connected to housing and other supports to break the cycle of homelessness.